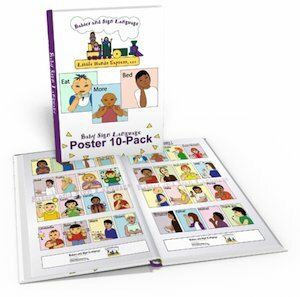 Baby sign language is a method in which you and your infant (or toddler) use specific handshapes and motions to convey words and meaning (quickly and easily) with each other. These exact handshapes and motions are executed typically using American Sign Language. 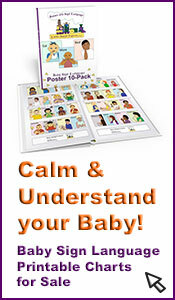 This special type of communication significantly reduces frustration for your darling little one. Most babies can hear but do not yet have the physical ability to speak more than a few words, if any. Since speech is formed through the use of trained vocal chords, most babies can only form basic sounds. 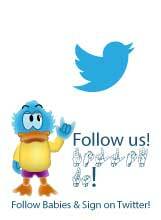 Communication is difficult (at first) and is usually made up of unintelligible noises and hand gestures. When frustrated, communication dissolves into crying, whining and sometimes tantrums. When Baby is frustrated, so are Mommy and Daddy. Sometimes when you look at the familiar in a new way, great ideas are formed. Hearing babies have been signing with their Deaf parents for ages. Two researchers looked at American Sign Language (ASL), and at a baby's form of communication, and saw compatibility. As a result of the pioneer research by the team comprised of Linda Acredolo and Susan Goodwyn, and (later years), of Joseph Garcia, Baby Sign Language was 'discovered' and developed. Does baby signing help or hinder? Most often, when something new is developed there will be skeptics. With the introduction of Baby Sign Language, critics claimed that it would slow infant language development. Research over the years has proven them wrong. Linda Acredolo received a grant from the National Institutes of Health to study verbal language development in signing babies versus non-signing babies. The results of the study, published in 2000, surprised the critics, because baby signers had more advanced verbal skills than the non-signing infants. There have been many other studies and the results are always the same. Infants who learn to sign develop their communication skills at an advanced rate. Over time, the use of Baby Sign Language has been widely used and adopted to solve a number of issues. 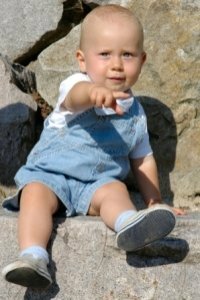 Infant sign language is taught to babies as a form of early communication. 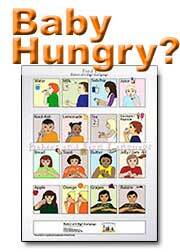 It is also used to teach children who have developmental problems and unable to learn normal speech at a normal pace. Baby signs growing - exploding! 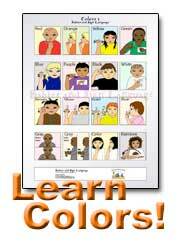 Today, Baby Sign Language is widely accepted as a legitimate infant communication program. It is hard to argue with success. When study after study proves it increases verbal skills, it is difficult to continue to be skeptical. Because verbal language development skills are developed early, the advanced development improves older children’s language skills also. Watch an infant sign for his “bear” or “milk” and that is your indisputable proof that infant sign language works! How do we learn baby signs? Babies already try to communicate on their own! Who else benefits from using baby sign language? Return from "What is Baby Sign Language?"